What do we want? Pizza! When do we want it? Now! Homemade pizza is easier (and faster) than you think. It used to take hours to knead and rise the dough but not any more. My quick & easy pizza dough is made from scratch and is ready to use in less than 20 minutes. I takes longer to heat up the oven but that’s okay because the dough can continue to rest until the oven heats up… or the grill. Yes! I have made pizza on the grill, on a pizza stone on the grill, in the oven on a stone, in the oven on a pan with holes, and even in a cast iron skillet on the stove. You can see that a pizza lover like myself needed to find a way to make pizza dough as quick and easy as possible. And I have. An hour before dinner, I preheat the oven. Then I put the dough together and let it rest. While I wait for the oven I prepare my toppings and make a salad. I shred my own cheese because the pre-shredded kind does not melt the same. I slice toppings and try to remove some of their moisture for a crispy pizza. Once the salad is made, I roll the dough, put on the toppings, and put the pizza in the oven, which has had time to heat up by now. (don’t put pizza in until the oven is hot enough) While the pizza cooks, we have our salad. As soon as we finish the salad, the pizza is done, hot, crispy, and ready to eat. 22 Comments on "20-Minute Pizza Dough"
Hello to my new favorite teacher ! Ive tried most of your breads and everyone is very glad of it. Question. I’m supposed to use whole grain everything. Is there an adjustment to make to the pizza dough ingredients if i use whole wheat pastry flour? I don’t know about adjustments since I have never made this whole wheat but I do know you should use whole wheat flour and not whole wheat pastry flour when working with yeast. I don’t think I did something correctly. You can refrigerate it right after kneading or even after it has rested for a while. Just cover it tightly with plastic, leaving room for it to expand in the fridge. To use it you should remove it from the fridge, leave the plastic on and bring it to room temperature. That should take at least an hour. Then shape and stretch to make your pizza – no punching down is needed. Hello I love the easy recipe but you didn’t put the temperature I have to cook pizza and how long I leave it in the OVEN ???? Can the dough be frozen? Another terrific recipe from you that my family can now do without! I can’t believe how simple and easy it was. My hat off to you once again! I have never made pizza before, and I was skeptical about even trying. I watched your video and said, “That looks easy”. So, I tried it. My husband said it was the best pizza he has ever had, and that’s a lot coming from him. He is a picky eater!! So, I just want to thank Jenny for the wonderful and easy recipie. I bake my at 450 degrees and then slide it out on the oven rack to get the bottom of the crust crunchy for 3 minutes. Very, very, Good Pizza! I love Jenny’s recipe because the dough handles beautifully. If you’ve never worked with yeast dough it’s perfect in its simplicity. It’s a great basic recipe that requires no weighing of ingredients, but once you’ve been spoiled with the 5-day doughs there’s no going back. Nothing else provides that artisan pizzeria taste or texture produced by the long fermentation. It’s as simple as that. This recipe is perfect because you can use it either way. Using this dough the same day produces a somewhat better-than-frozen-pizza crust, which is reason enough to make it if you need pizza tonite. But for a much better crust, definitely use bread flour and increase the salt to 3/4 tsp. After letting it sit for a few hours on the counter, form your ball, roll it around in a lightly oiled bowl and put it in the fridge, tightly covered for even 24 hours before using. If you don’t notice a big difference you need a better quality flour. I don’t mean fancy-dancy/locally milled/organic yada yada, but see if they have King Arthur brand. I live in the least trendy area imaginable and our stores carry it. Let that dough sit for THREE days and you could sell it. It’s that good. It takes no more effort to do this. It takes about ten minutes to make Jenny’s dough, including cleanup – you can make some every few days and always have it on hand in the fridge, ready to go. I make double batches and make sure there’s dough in the fridge for the weekend in case anyone pops over. I’ve yet to throw any out, but if I had to – it’s just flour and water, and won’t break the bank. I’ve made it with regular flour and bread flour. If you’re using quality flours there’s definitely a big difference in texture. The bread flour provides a lighter, crisper crust, even if you make a thicker one. 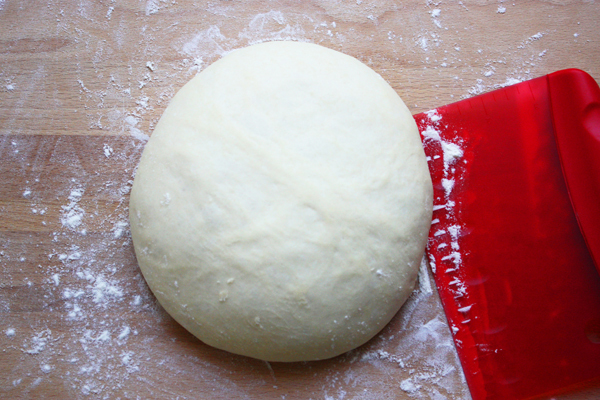 Stretching your dough keeps it light, whereas using a rolling pin compacts it, making it tough. Home temperature matters, especially if you keep a very cool house like I do. I put my wood dough board on top of the stove while the oven heats up. My room-temp dough is only 61 degrees six months out of the year, and needs to rest on a warm board to relax enough to stretch. I use a stone, two when necessary. I get the best results at 470-475 degrees for 16+ minutes. I like a rimmed edge to keep the sauce from running off, and that rim gets too hard at 500 degrees. That temperature and time has worked for me using thin crusts or thick Sicilian, regardless of the toppings, including uncooked bulk Italian sausage, in pans or on my stones, for over thirty five years. I’ve always used thick, heavy duty aluminum pans, though, and not non-stick, so there’s never been any burned-bottom issues. I’m not a baker or even a foodie, just an old grandma. But I do know pizza, and you can’t go wrong with this recipe. Play around with it – you’ll be surprised at what it can do. Thank you taking time so share so much good information! Loving reading all these comments! Will make my first from scratch pizza dough due to this site. Thanks JJ ! Thank you so much for posting your wonderful recipes. My two boys and I love your pizza recipes. This dough is so easy that even my 14 year old makes his own pizzas, and even agrees it is better than delivery. 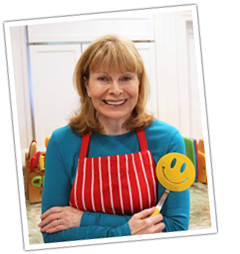 I can’t thank you enough for helping me teach my boys the value of delicious, healthy meals with your recipes! Thank you for this recipe, Jenny! Now, I have a pizza dough recipe for life !! The crust is crispy, and oh so flavorful! Forget about the frozen pizza, the uncooked center and loads of additives. Forget about waiting forever for delivery. This crust has the perfect texture, and is so easy/fast to make! I made it for dinner tonight and my husband and I really loved it! I see this becoming a regular at home, specially after we have consciously cut down on fast food. I will send you a picture that I took before devouring it in < 3.5 mins! Thanks again! You say you preheat the oven but I can’t find what temperature you set it at? There is no temperature listed because this is only a recipe for the dough. Your pizza recipe would determine the temperature. If using a pizza pan like my pepperoni pizza, I bake it at 425. When using a pizza stone like in my barbeque chicken pizza, I bake it at 500. If you tell me what kind you are making and what equipment you are using, I may be able to suggest the best temperature.